Delicate Curves Jewelry - This is a handcrafted three-dimensional Sterling Silver pendant featuring a purple Lab Created round Alexandrite stone. This One-of-a-Kind necklace comes with an 18" sterling silver snake chain. 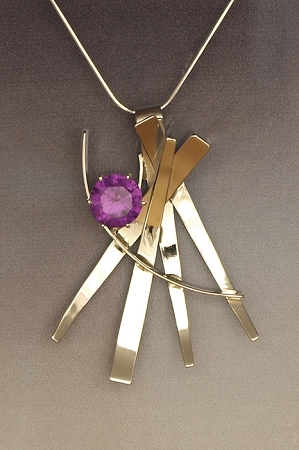 Hand fabricated sterling silver necklace from our "Wisps of Silver" collection features a round cut Lab Created Alexandrite, which does change colors from pink to purple in different types of light. This necklace comes with an 18" sterling silver snake chain and is a perfect compliment to our other Alexandrite jewelry.This necklace is an artistic work of art and is signed and created by Aaron Rubinstein and Modern Art Jewelry.